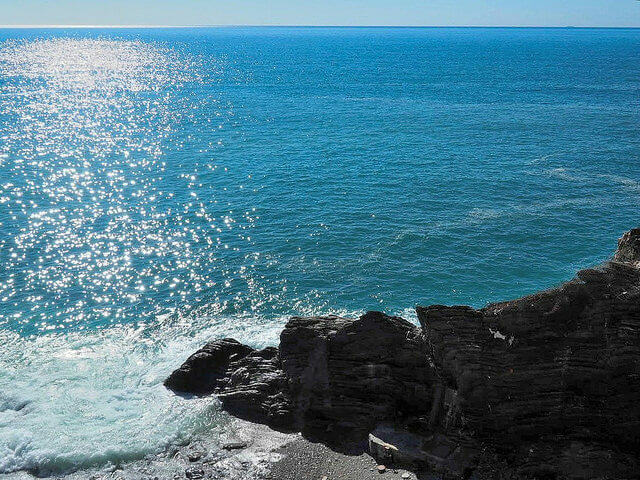 La Lampara Sea View Terrace AC Apartment is an exclusive Manarola sea view holiday apartment in a typical tower house. This charming property lies in the most prominent and scenic part of the village of Manarola. The building is in one of the most ancient residential areas of all the Cinque Terre, dates back to XI century and has 4 floors, at exclusive use of two apartments, charming La Lampara (developing on 2 upper floors) and Il Baluardo (on the 2 lower floors). This charming location is holiday destination of famous fashion designers, writers and painters who found here the ideal place for getting inspiration and energy for their precious art. Essentiality and simplicity are keywords of La Lampara. We recommend it as the ideal solution for an easy way rental holiday at sea, away from the daily burden. Entering La Lampara Sea View Terrace AC Apartment we find, on ground floor (second of the tower house), a small entrance hall, 1 double bedroom and 1 twin bedroom (that can be turned into a double), both with great sea-view and a bathroom with shower and washing machine. Through a curious winding staircase we reach up a large open space with sitting/dining room and kitchen corner. Kitchen has gas stove, refrigerator and microwave oven. There’s no dishwasher. In sitting room area two couches . One of the two is a regular bed with single mattress , the fifth bed of the property. The property has air conditioning equipment and splits work also as heaters. La Lampara has a fantastic wide balcony which opens from the sitting room like a vessel deck. On the balcony table and chairs for enchanting dinners under a starry sky and amusing wine tastings. La Lampara Sea View Terrace AC Apartment has a fantastic location. It is in the most prominent part of the village, it has total sea-view, but it is also walking distance to the lively restaurants, pubs and stores of the village. La Lampara is one of the most amazing properties in the area, where romance is main theme and sunsets will always warm your heart and memories. Choose is for its amazing terrace. La Lampara sunsets will always be in your heart! La Via dell’Amore, the world famous scenic path that leads to Riomaggiore departs approx. 500 meters far from La Lampara. Now, due to restoration, is only partially open for one third of its total length. Access is from Manarola train station, entrance to the left of the National Park office. La Lampara Sea View Terrace AC Apartment lies in a historical medieval building right over the cliff. In spring time, mostly one week in Ma, jelly fish land on the cliff below, releasing a peculiar smell that can be felt sometimes from the apartment as from all other apartments on the sea. It is a natural phenomenon limited just to a few days during the year. We inform about this since a few years ago a customer (just one actually) lamented this problem. Being uphill, as most of the properties in Manarola, requires that guests be in good shape and without walking difficulties. Porterage both from the train station or from the car parking is available on request and at extra charge.